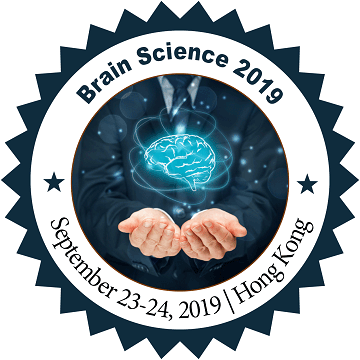 After a successful conference in 2018, Conference Series LLC Ltd is very delighted to invite you all to the "32nd International Conference on Brain Science and Cognitive Research" (Brain Science 2019) scheduled on September 23-24, 2019 at Hong Kong. We are progressively working for the initiation of a new world, perspectives and views in the field of Neurology and Neurosciences. Conference Series LLC Ltd is providing a great platform for thousands of neurologists meet, learn, share and exchange views. We are concentrating on the view that everyone should gain from the conference. So, we are organizing plenary sessions, poster exhibitions and section programs, workshops at the conference. Brain Science 2019 would be a platform where experts from universities, Neuroscience associations, research centers and from the societies and universities related to Neurology gather and share their insights. So, we invite all the participants who are interested to be a part of this conference for interconnecting National and International experts, researchers and decision makers both from academia and industry. Brain Science 2019 is supported by related journals and their editorial board members which provide a chance of meeting them, along with experts in Medicine, Neurosciences and in the field of Neurological Disorders. Brain science and cognitive psychology is the most versatile psychological specialty. A human brain is an amazing tool which allows us to learn, see, remember, hear, perceive, understand and create language. Magnetic resonance imaging (MRI), a new technology that allows researchers to see a picture of the brain at work-helping them to understand how a brain reacts to a particular stimulus or how differences in brain structure can affect a person’s cognitive functioning, personality or health. Neurobiology of Brain Disorders provides an overview of the development of brain and clinical research on nervous system disorders including Huntington, Alzheimer, OCD, PTSD, schizophrenia, ADHD, Down syndrome, autism, muscular dystrophy, diabetes, TBI, Parkinson, depression, pain and its prevention. Stroke is a brain attack, occurs when blood supply to the brain is interrupted. Stroke is a medical emergency, immediate action can reduce brain damage and complications. The signs of a stroke include confusion, trouble walking or talking, dizziness, sudden severe headache, weakness, numbness, vision problems and slurred speech. In the USA, stroke is the 5th leading cause of death. Neuro-Nanotechnology is an upcoming treatment approach in the field of Neuroscience. Nanotechnology deals with nanomaterial’s and the collaboration of nanotechnology with neuroscience can convert basic science into novel materials for the treatment and observation of the pathological condition in neurological disease. Neuropsychiatry is the study of Psychiatry and Neurological disorders like multiple sclerosis, Parkinson’s disease, and epilepsy. These two fields are brought together by advances in neurology. To interpret and assist patients with complex neuropsychiatric problems like these a practitioner must have a good knowledge of both the mental and physical aspects of the illnesses. Neurodegenerative Diseases causes progressive death of neurons in the brain. It affects many of our body's activities, such as balance, movement, talking, breathing, and heart function. Treatment may help relieve some of the physical or mental symptoms associated with neurodegenerative diseases, currently, there is no way to slow the disease progression. Neurodegenerative diseases affect millions of people worldwide. Brain imaging is useful to investigate the workings of the human central nervous system. To investigate brain physiology like pharmacology, brain metabolism, and blood oxygenation. Neuroimaging produces images of the brain utilizing a number of technologies directly or indirectly. Neurosurgery deals with the diagnosis and treatment of brain injury, brain diseases, brain disorder, spinal cord, spinal column, and peripheral nerves. The spinal cord carries signals back and forth between the body and brain. Spinal cord disorders can cause permanent severe neurologic disability such disability can be avoided or minimized by immediate treatment. Neuropsychology deals with both Neurology and Psychology. It is the study and characterization of the behavioral modifications that follow a neurological trauma or condition. Neurorehabilitation is a complex medical process helps in recovering from nervous system injury or minimize any functional alterations. Neuroimmunology is a field that deals with Neurology and Immunology. It helps in the development of novel pharmacological treatments for many neurological diseases. Neurological infections occur when viruses bacteria invade the nervous system. They reach the brain through the bloodstream. Neurodegeneration is the gradual loss of the role of neurons, including the death of neurons. Such diseases are mostly incurable and cause progressive degeneration and death of neurons. It affects activities like breathing, talking, balance, movement, and heart function. Treatment may help improve symptoms, relieve pain, and increase mobility. The most common neurodegenerative diseases include Alzheimer's disease and Parkinson's disease. Pediatric Neurology deals with the identification and treatment of neurological conditions in neonates, infants, children, and adolescents. Many veterans suffer from neurodegenerative changes such as Alzheimer's disease, Lewy Body dementia, Parkinson's disease, vascular dementia, and other age-related central nervous system changes. Geriatric Neurology deals with neurologic problems in the elderly. The worldwide neuroscience showcase is relied upon to observe a promising development in the following couple of years. The rising dimension of rivalry among the main players and the rising spotlight on the advancement of new items are probably going to offer promising development openings all through the conjecture time frame. The examination think about on the worldwide neuroscience showcase offers a point by point review, featuring the key angles that are relied upon to upgrade the development of the market sooner rather than later. The key division and the aggressive scene of the market have additionally been referenced finally in the exploration consider. The worldwide neuroscience advertise estimate was esteemed at USD 28.42 billion out of 2016 and is relied upon to develop at a CAGR of 3.1% over the conjecture time frame. High affecting elements, for example, progressing cerebrum mapping examination and examination ventures, neuroscience-based activities by government bodies, and mechanical advances in instruments and calculations that are actualized in neuroscience space, are required to move the market development. These variables are foreseen to support income age by prodding the item appropriation in this market all through the figure year. The worldwide market for neuroscience is focused in nature and is anticipated to observe an abnormal state of rivalry among the key players in the following couple of years. The developing spotlight on the innovative work exercises and advancements is anticipated to help the development of the general market in the following couple of years. Also, the rising mergers and acquisitions and coordinated efforts is probably going to upgrade the development of the market sooner rather than later. A portion of the key players working in the neuroscience showcase over the globe are Plexon Inc., Alpha Omega, Femtonics Ltd., Kendall Research Systems LLC, Doric Lenses Inc., Siemens Healthineers, GE Healthcare, Laserglow Technologies, Neuralynx, Thomas RECORDING GmbH, Mediso Ltd., TRIFOIL IMAGING, Prizmatix, and Neurotar. The report offers an exhaustive assessment of the market. It does as such by means of inside and out subjective experiences, chronicled information, and obvious projections about market measure. The projections included in the report have been inferred utilizing demonstrated research systems and suppositions. Thusly, the exploration report fills in as an archive of investigation and data for each feature of the market, including however not constrained to: Regional markets, innovation, types, and applications.